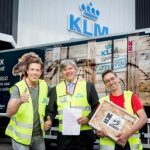 KLM Cargo this week transported the skeleton of a Tyrannosaurus Rex from the United States to the Naturalis Biodiversity Centre in Leiden. The T.rex, nicknamed Trix, weighs around 6,000 kg and is around 13 metres long. The skeleton, found in Montana, USA, landed at Amsterdam Airport Schiphol on Wednesday, 24 August. It was carried to Leiden by truck today, accompanied by TV presenter Freek Vonk. Trix roamed North America around 66 million years ago. The Tyrannosaurus Rex is one of the best-known dinosaur species in the world, because it appeals to the imagination, having been one of the biggest predators on the face of the planet. Trix’s bones were carefully excavated in 2013, under auspices of the Dutch palaeontologist Dr Anne Schulp. Trix will be proudly displayed at the Naturalis Biodiversity Centre in Leiden from Saturday, 10 September, when the exhibition “T.rex in Town” opens to the public. 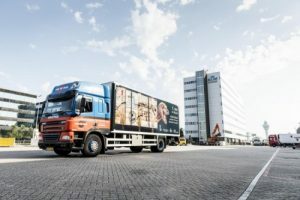 KLM Cargo is the airfreight division of KLM Royal Dutch Airlines, transporting regular cargo as well as special and unusual shipments, ranging from exclusive paintings and sports cars to race horses and rhinos, and now even a T.rex. 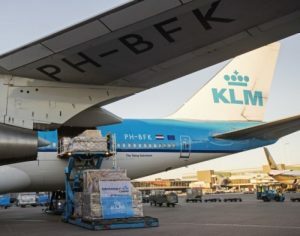 In 2015, Air France KLM Cargo transported 1,2 million tonnes of freight.